The carpenter bee, along with many other bees in the world, belongs to the hymenoptera family, which includes hornets, wasps, and some ants. Most of the carpenter species live in the southwest region of the United States. The most common species of hymenoptera bee that occurs in Arizona is the Ôvalley-carpenter-beeÕ. There is about 730 known species of carpenter hymenoptera bees in the world.They are a larger species of bees; less fuzzy than the bumblebee. 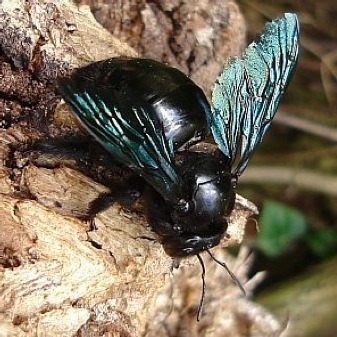 Most of the females species are black or blue with a metallic sheen and may be up to 1 inch long. The males species have a light brown body with light green or yellowish-green hairs, somewhat smaller than females. They are able to maintain their body temperature when the air is cool Piles of sawdust beside the nest entrance and the presence of many bees in flight in the area provide clues that a nest is near. Females have stingers; males do not.